Dr. Yaoguang Rong gave an invited talk on the EMN Meeting on Photovoltaics，entitled“Mesoscopic solar modules: from dye-sensitized to perovskite”. Mesoscopicsolar cells (MSCs) based on three-dimensional interpenetrating networkjunctions have attracted much attention due to the advantages of low materialcosts and simple fabrication processes. Dye-sensitizedsolar cells (DSSCs), the first-generation MSCs, have made various breakthroughson working mechanisms, functional materials and device architectures in thepast years, which motivated the research on this photovoltaic (PV) technology from laboratory investigations to practical applications. [2, 3] Recently, the second-generation MSCs, mesoscopic perovskite solar cells (MPSCs) based onhybrid organic–inorganic halide perovskite semiconductors have boosted thedevelopment of this PV technology. Benefiting from the optimization of depositionapproaches, design of new material systems, and diversity of device concepts,the efficiency of MPSCs has increased from 2.19% in 2007 to a certified 20.1%in 2014. Inspired by the latest amazing advances, more and more researchersattempted to develop large-area mesoscopic solar modules to promote the commercializationof this technology. Due to the advantages of both material costs andproduction costs, MPSCs have been regarded as one of the most promisingcandidates of the next-generation PV technology. It is believed that the dreamof generating electricity with a cost-effective PV strategy will be realized inthe near future. 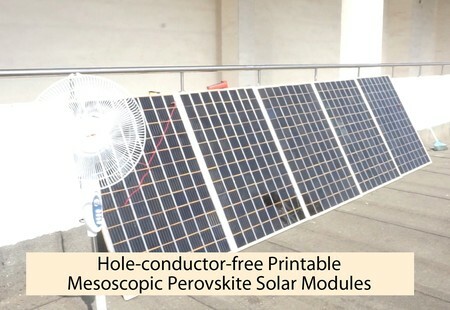 mesoscopic perovskite solar modules (10 cm × 10 cm). 1. M. Grätzel, Acc. Chem. Res. 42, 1788 (2009). 2. H. Han, Udo Bach et al., Appl. Phys. Lett.94, 103102 (2009). 3. Y. Rong, H. Han et al., Sol. Energy Mater. Sol. Cells105, 148 (2012). 4. S. Si, Y. Rong, H. Han et al.,Front. Optoelectron., In press. 5. Y. Rong, L. Liu, H. Han et al.,Adv. Energy Mater. 1501066 (2015).